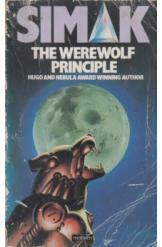 The Werewolf Principle by Clifford D Simak, Sci Fi. Book is in good condition, all pages intact. After 200 years drifting in space, Andrew Blake is rescued and returned to Earth. Too late, he learns that his body has been inhabited by two alien consciousnesses; a biomechanical computer, and a monstrous werewolf like beast.